Demographic change, rising house prices and supply shortages have established residential alternatives as desirable investments with positive rental growth prospects. The global search for secure income streams and high risk-adjusted returns is drawing more and more investors to the sector. While technology has disrupted multiple established sectors, most notably retail, sleep is one thing technology can’t disintermediate. Investment in beds is now attracting institutional investment at scale. But as the sector has entered the mainstream and investor interest has grown, yields have come in and are now more in line with ‘traditional’ real-estate sectors. Performance is heavily reliant on operator performance and intensive management. Technological innovation and sector consolidation will improve efficiencies in the future, something already motivating major mergers and buyouts across the globe. Global residential investment volumes1 have grown by 52% in the last five years. In 2017, investment volumes were 36% higher than retail, with $223bn invested globally (but still only two-thirds of the total investment into the office sector). Multifamily residential investment is a mature and established asset class in the US, and last year it accounted for 72% ($160bn) of all global residential investment alone. The student housing and senior housing sub-sectors are small by comparison with $17.5bn and $17.4bn invested last year, respectively, but these too have seen growth of 87% and 10% since 2013. Investment in student accommodation saw another record year in 2017, with $17.5bn invested globally, up by 4% from $16.9bn in 2016. The UK and Western Europe accounted for over half of this investment (51%, $8.9bn), a 35% increase from the $6.6bn invested in 2016. The UK, Germany and Spain were the most active single country markets in Europe (see The view from Europe, below). Global investment into senior housing2 was of a similar scale to student housing investment in 2017, with a total $17.4bn invested, a 31% rise on 2016 but down from 2015’s peak of $18.8bn. Total global residential investment was also down very slightly on its 2016 peak, but still 51% above the 10-year average. A wide range of investors are now involved in the buying and selling of these three asset classes. Investment managers, Public Real Estate Trusts, Equity Funds and Developers among the most active. GIC, Singapore’s Sovereign Wealth Fund, was among the top five investors of both multifamily and student accommodation between August 2017 and August 2018 and also invested in senior housing. Insurers, including AXA Group and Allianz, are active too. Greystar was the single largest participant in both the multifamily and student housing sectors. Student housing attracts the greatest proportion of cross border investors of the three, accounting for 46% of total investment last year, compared to 17% in the case of multifamily, and 25% in the case of senior housing. The largest residential deal in the last year, however, was cross border. In December 2017, Blackstone purchased a majority stake in Banco Popular’s Spanish portfolio, comprising 25,800 residential units at a value of $10.3bn. Already active in Spain, Blackstone is using the deal to expand its rental portfolio in the country. The search for scale was the driving force behind the third largest deal. Vonovia, Germany’s largest listed residential landlord, acquired Austrian rival BUWOG. The deal adds 27,000 units to the German property company’s portfolio in Austria and Germany, and will generate efficiencies by centralising operating platforms. Rising transaction activity has put downward pressure on yields as capital values have risen. The downward yield trajectory also reflects a re-assessment of risk in these asset classes, that until recently were still considered to be ‘emerging’ and priced accordingly. 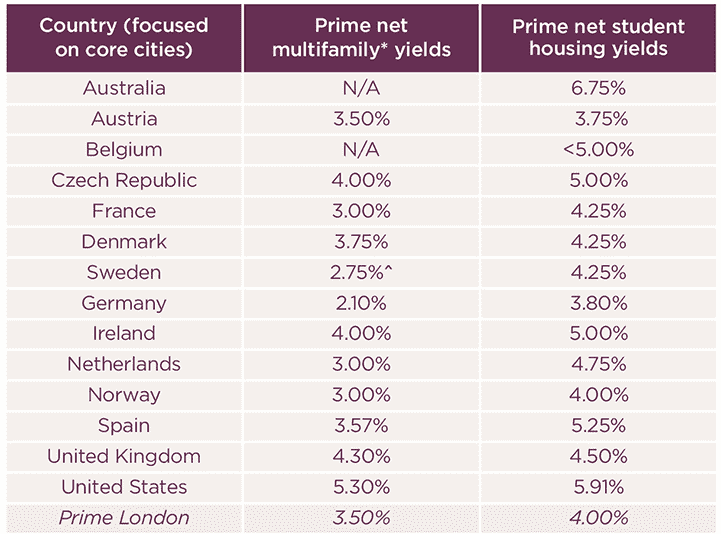 Prime net multifamily yields across 11 major European countries average 3.4%, ranging from 2.10% in Germany to 4.3% in the UK. Student housing prime net yields average 4.5% across the same countries, and range from 3.75% in Austria to 5.25% in Spain. The senior housing rental model of the type explored in this report exists in fewer countries, but net yields stand at 4.15% in France, where it is most established. Prime US multifamily prime net yields stand at 5.30%, and student housing yields are 5.91%. Prime net yields in Australia for student housing are high, at 6.75%, but have too compressed in recent years as investor demand has grown against a backdrop of limited supply. There is, as yet, no institutional market for multifamily housing here. We expect to see yields compress further as one of the major perceived obstacles, management risk, is overcome. 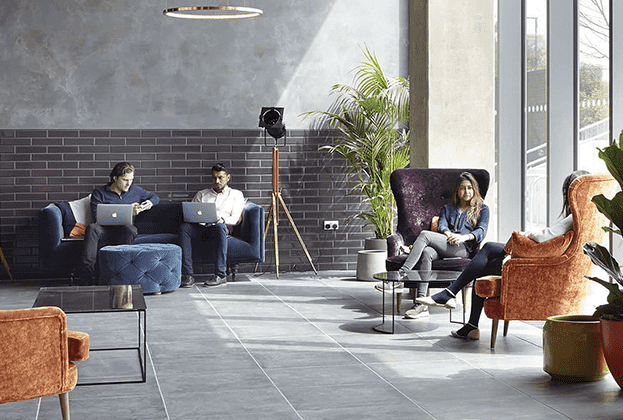 Dealing with many hundreds of individual occupiers makes managing more costly and time consuming than a single-tenant office building, and poor management can mean reputational risk. Investor attitude to risk is changing too, increasingly looking at assets on a case-by-case basis, rather than by asset class. Even in the office world, corporate leases are shortening as corporations hedge against future technological disruption. Multiple occupiers on flexible leases are becoming more commonplace. In future, a broad mix of individual tenants, spreading income risk among many occupiers (if managed efficiently), may be seen as preferable regardless of the use class. 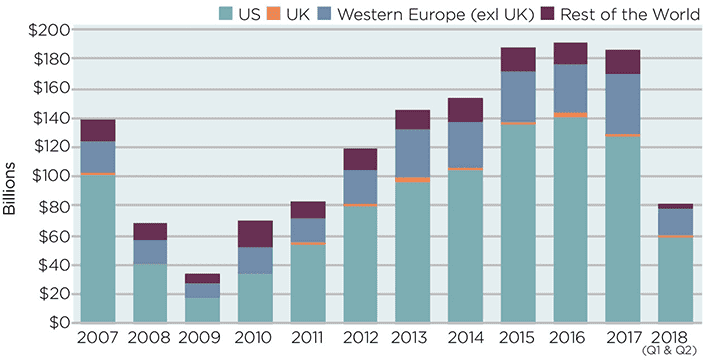 Multifamily investment across eight major European markets exceeded €27 billion last year, still a fraction of US volumes, but up 19% since 2013. 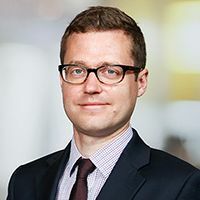 Sweden, the Netherlands, Denmark and Germany have established institutional residential markets, offering the most liquid market conditions for trading. Germany is by far the most active European market accounting for 54% of investment across seven major countries in the last three years. Total German residential investment volumes totalled €13.4 billion last year, up 19% over 2016 levels. With competition in first-tier German cities strong, investors are being driven to secondary locations where they are acquiring and consolidating smaller portfolios. Under-valued cities are now scarce. Sweden is another established multifamily market, 21% of all transactions were residential in Q1 2018, second only to offices. Recent record-high volumes are expected to decline, however, as investors focus on developing existing assets rather than acquiring new ones. In the UK, multifamily is still a young sector. Total volumes stood at £2.6 billion in 2017 (just 18% of Germany’s investment volumes), but this was up 20% on 2016. Volumes have held up in spite of Brexit uncertainty, but are largely unchanged from five years ago. Last year, 70% of deals were forward funding and forward purchase deals. The focus on the development of new stock is likely to fuel more transaction activity in future. 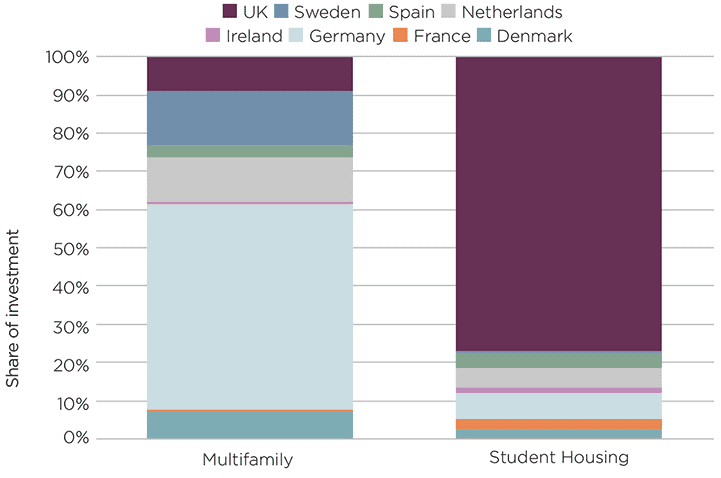 The UK is by far the largest market in Europe for student accommodation, and has seen transaction volumes on par with the US in the last three years (a market with a student population almost 10 times the size). Now a mature market, total UK student housing investment volumes are down from a 2015 peak, but 2017 was still another strong year with £3.9 billion invested (excluding development sites). International investment accounted for around two thirds of activity over the period. PBSA investment in Germany, the Netherlands and France has seen rapid expansion in recent years and global players seek new opportunities. 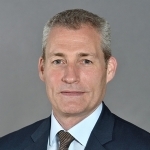 A major vote of confidence in the sector in Germany was made in 2018 when Brookfield acquired a controlling stake in International Campus Group, a European real estate development and asset management platform focussing on student, young professional housing and micro-living (although the assets are still owned by institutional investors). With 11,800 beds under operation or planning, it aims to deliver 20,000 beds in the medium term across Western and Central Europe, with an emphasis on Germany. Through its brand ‘The Fizz’, it targets both students and young professionals (see ). Volumes in Spain were boosted to record levels in 2017 with Greystar’s acquisition of the Resa portfolio, and GSA’s purchase of Nexo Residencias. In the Netherlands volumes were down from almost €500 million in 2016 to €250 million in 2017 due to a shortage of investment product. A large amount of new construction underway may boost investment volumes in the medium term, however. In April 2018, Aberdeen Standard Investments launched a pan-European residential property fund – the first of its kind. The fund focuses mainly on the European Private Rented Sector, but a quarter of the portfolio will also be invested in student housing, senior accommodation and nursing homes. 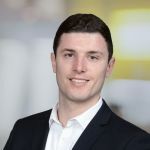 Commerz Real's Smart Living Europe Fund was launched in August, targeting student accommodation and micro-apartments across the continent. The creation of such funds highlight the increased appetite for investment across multiple residential subsectors and jurisdictions. In 2017, Union Investment launched the Urban Living Nr.1 real estate fund, which focuses on the micro-living segment in urban areas across Europe. The investment opportunities include branded student accommodation and hotel-like serviced apartments. We expect similar funds to become commonplace in the near future.